Dear Readers, a pair of stately holm oaks stand outside Dad’s nursing home in Dorchester. I remember being surprised by them on the very first day that Mum and Dad arrived, and thinking that I had never seen an evergreen oak before. Little did I know that the south west of England is a hotspot for this plant. It comes originally from the Mediterranean, and was one of the southern European trees planted on the Mamhead Estate in Devon by Sir Thomas Balle, who also introduced ‘cork, ilex, wainscot, oak, Spanish chestnut, acacia, and other species of exotic trees’ (Britton and Bayley ‘The Beauties of England and Wales’ (1803)). It is now seen as a dangerous alien invader which is accused of damaging biodiversity. In theory, it is not fully frost hardy, and so shouldn’t be able to get too far north. However, with climate change it has recently popped up as far north as Cumbria. There is a high concentration of holm oaks around St Boniface Down near Ventnor in the Isle of Wight, and on the coastal sand dunes near Holkham in Norfolk. Both of these are vulnerable habitats but, as the acorns are spread by jays, rooks and grey squirrels, who bury them to provide sustenance during the winter, it’s difficult to see how they can be completely controlled. The big danger is in that extensive, evergreen canopy, which shades out other plants. There is, however, a DEFRA plan in place to keep an eye on the spread of the species and to take action as necessary. In ‘Alien Plants‘ by Clive Stace and Michael Crawley, it’s noted that holm oak also spreads along the side of railway lines, probably being buried in the soil of the embankments by those pesky squirrels. 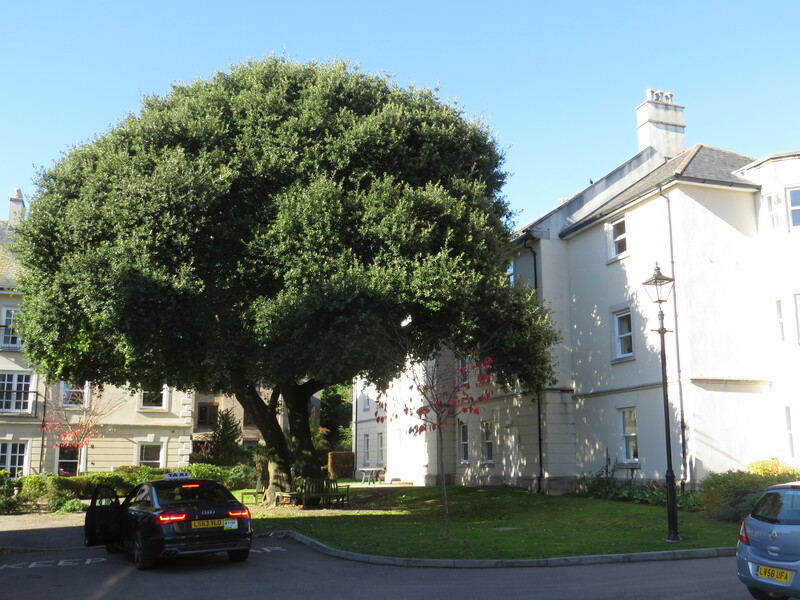 There are also two holm oaks featured in ‘The Great Trees of London‘ by Jenny Landreth, one in Fulham Palace Gardens and one in Valence Park in Beacontree, not far from where I used to live. 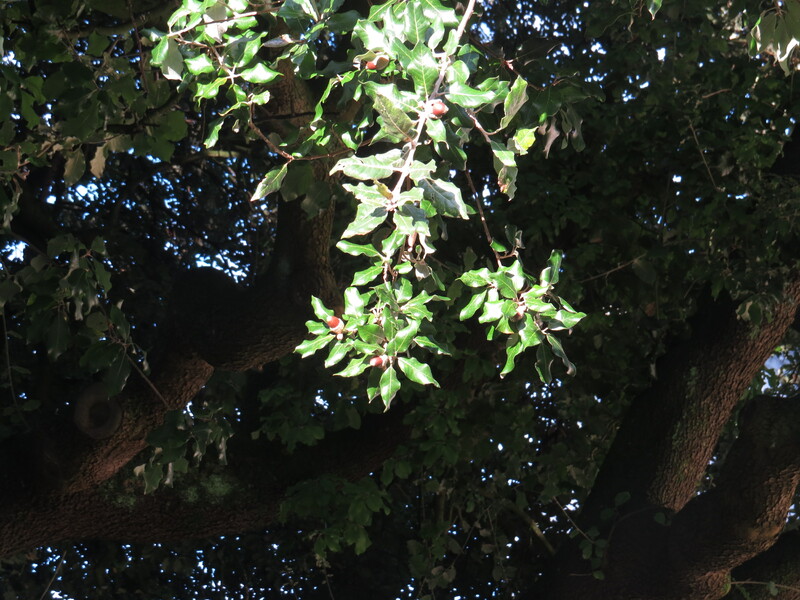 There are two subspecies of holm oak: one has bitter acorns, and grows from northern Spain and France to Greece, and the other has sweet acorns and grows in southern Spain and North Africa. These can be very long-lived trees: the ones on the Mamhead Estate are still there after over two hundred years, and there is a grove of the trees in Malta that are said to be between 500 and a thousand years old. The tree can grow to massive size, with one in County Wexford in ireland being over 20 metres tall with a spread of 43 metres. These are fine trees, with dense shade from the holly-like leaves (which is what gives the tree its name – ‘holm’ is an old word for ‘holly’). I imagine that people will enjoy sitting on the seat under the pair beside the nursing home once the weather gets warmer. As the nursing home used to be a maternity hospital, I can also imagine people pushing their prams into the welcoming coolness of the shade. In its native regions, holm oak is one of several trees that are used in the creation of truffle orchards or truffieres. The tree has an association with the mycorrhizal fungus which produces truffles as its fruiting body, whilst the fungal ‘roots’ help to increase the amount of moisture and nutrients that the tree can extract from the poor, drought-prone soil that it grows on. Back in 1790 a Frenchman named Pierre II Mauleon decided to try planting acorns from oak trees which were known to have hosted truffles. It takes some 7-10 years for the fungus and the tree to establish themselves, but Monsier Mauleon was patient, and his experiment was eventually successful. In the nineteenth century, much of the area where the Phylloxera virus had destroyed the grapevines was turned, instead, to truffle production. 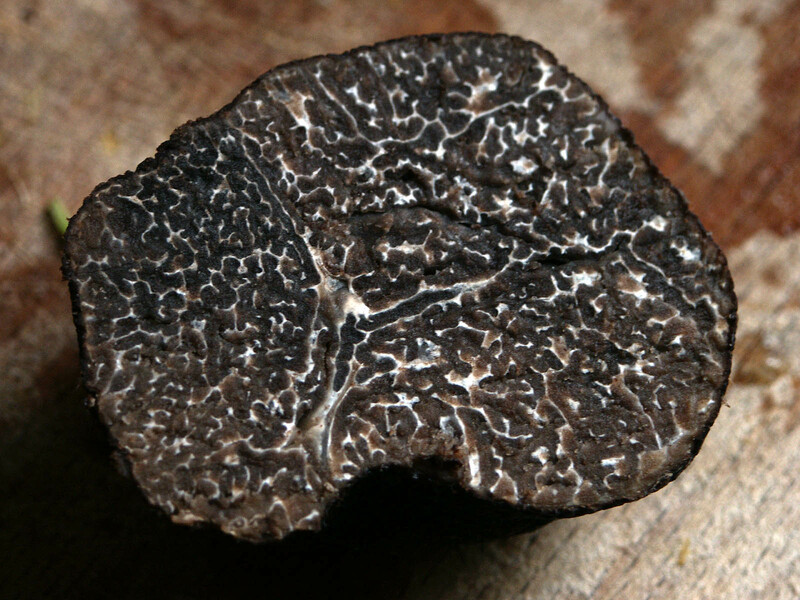 Today, truffles are grown in many parts of the world, although the connoisseur considers that the Perigord truffle is the best of the bunch. Personally, I find that a little truffle goes a very long way (which is just as well considering how expensive it is). 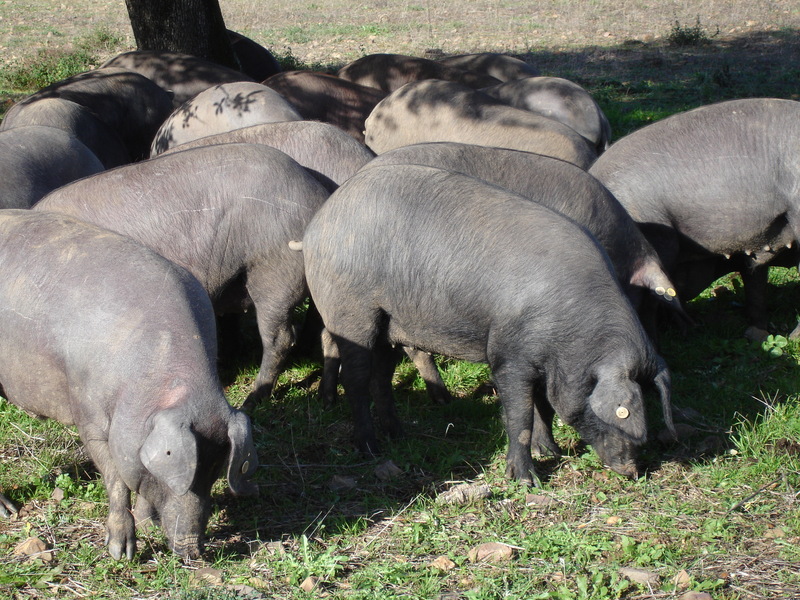 The acorns from holm oak are food for the free-range black Iberian pig, and is said to be one of the elements that flavours their meat. Jamon iberico, a distinctive ham, can be produced only from this breed of pig, and is always produced from wild-foraging animals. The wood from holm oak is hard and tough, and has been used in the manufacture of everything from wagons (as described by Hesiod back in 700 BCE ) to wine vessels. It is also used for charcoal and firewood in its native range. Holm oak is also very amenable to being used for hedging, and for pruning into formal shapes. 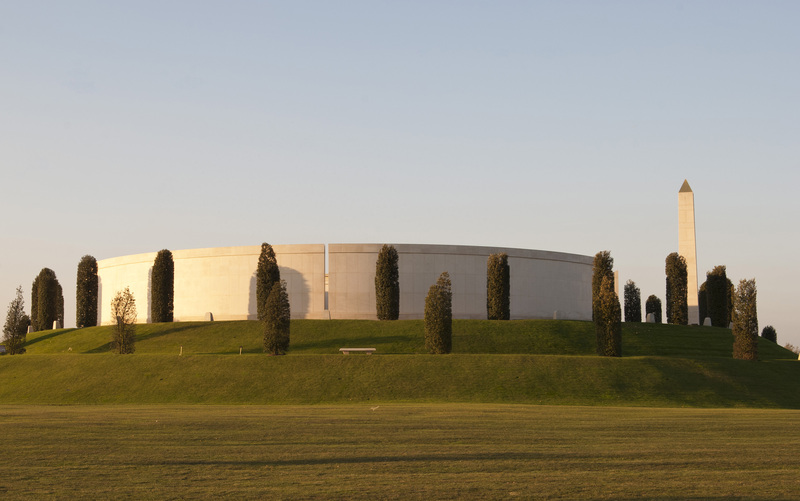 The Armed Forces Memorial in Staffordshire is surrounded by 50 holm oaks which have been pruned into cylindrical shapes, echoing the tumulus-like design of the memorial itself, which honours over 16,000 servicemen and women who have been killed in the line of duty since the end of the Second World War. It is, of course, impossible for me to divorce this particular tree from the memories that I have of the nursing home, of Mum’s last days and of my Dad’s rapidly deterioration due to vascular dementia. The two trunks remind me of what a pigeon pair Mum and Dad were, and how lost Dad often seems without her. And so, this poem by Stevie Smith, included in her final collection before her death, seems particularly fitting, in its simplicity and lack of sentimentalism. Where have the dead gone? Is it where I may go? This entry was posted in London Plants on March 20, 2019 by Bug Woman. Thank you again for your blog. I live in West Dorset and can identify with so much of what you write about. They might be invasive but I like Holm oaks…there is a large one atop a prominent tump at Junction 7 of the M5 which is the exit I use coming home from the south west. We always say when you see the holm oak we are nearly home! So much of interest here – thank you. It does look as if the tree has been planted a bit too close to the building though – There must be many rooms that get very little light. Hope your Dad has a room that lets light stream in. 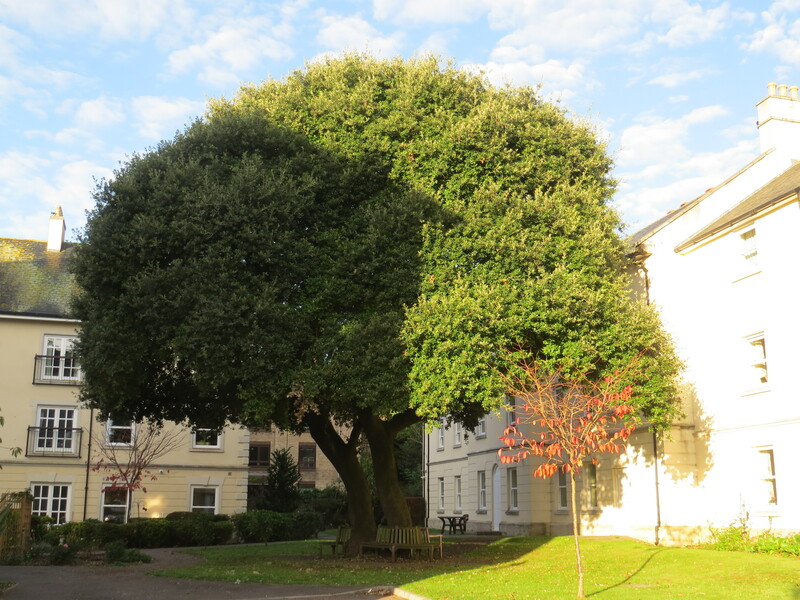 Or am I being stupid – Did the holm oak appear before the building? Probably a very old tree. Hi Alyson, the home used to be a maternity hospital – many of Dad’s neighbours were reminiscing about how they gave birth to their children there! So I think the trees have been there for a long, long time. Dad’s room is very sunny, but he spends most of his time in the communal areas. He was telling me that yesterday he drew a picture of a rabbit wearing a hat, so I guess all is well…. They are surely magnificent trees. We know this as holly oak. It happens to be one of my least favorite trees, and just might be my least favorite of the common trees. It is almost always infested with scale, which of course makes a sticky mess with honeydew . . . which, of course, becomes infested with sooty mold. Yet, because of its resiliency and complaisant root system, it had been a common street tree in San Jose for decades prior to about 1970. Consequently, there are many streets in the prettier neighborhoods of San Jose where cars parked at the curb are regularly coated with a thin layer of sooty syrup. ICK! Once in a while, I see exemplary specimens that are worth the mess. On rare occasion, I see an exemplary specimen that is not making a mess! Holly oak is remarkably tough, and behaves quite like our native coast live oak. We have a similar problem with lime trees in London – they were actually amongst the first street trees planted, but they too attract aphids and hence honeydew. 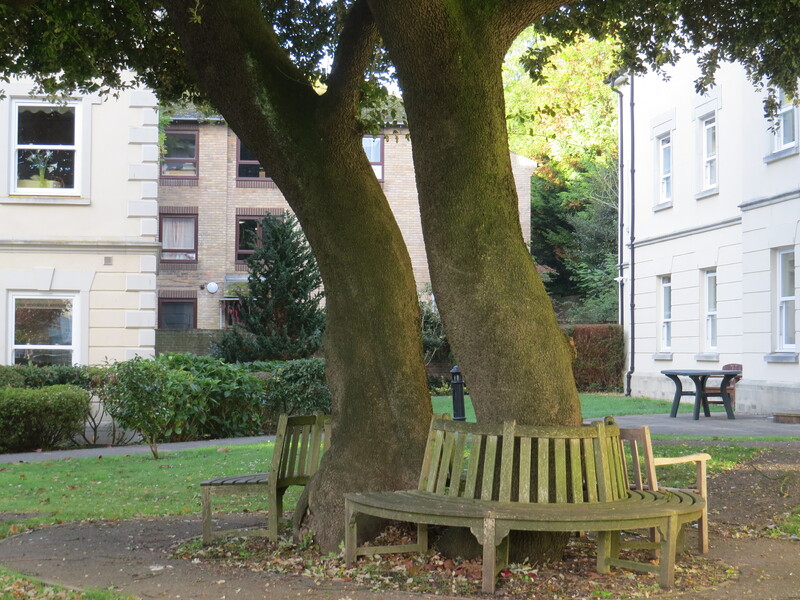 One reason that they were replaced with London Plane was because the lime trees were so messy…. We know them as lindens, and they are quite rare here. I am not certain if they do well, because I have seen only a few. The few that I know of happen to be doing quite well. They are beautiful trees, heavy with scent and blossom and fine in the countryside, just not ideal as street trees….